From the Hunebedcentrum in Borger you can make a nice cycling tour accross the Hondsrug. 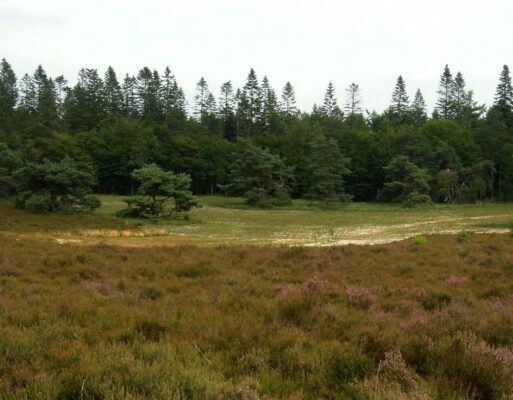 You’ll visit four important hot spots near Borger: the ‘buunerbult’ with a spectacular view of the Hondsrug; the slopes of the dry valleys from the last ice age in the Hunzebos; the Molenveld heathland with the enigmatic ‘Leewal’ near Exloo and the glacial hollow near the small town of Ees. Together they illustrate the story of the ice ages in the Hondsrug area and its relics. This cycle tour utilizes the system of ‘fietsknoopunten’, the national system of grid nodes for cycling tours. Numbered signs will guide you from node to node. You can also design your own tour, using information from op www.fietsenindrenthe.nl. This remarkable ridge in the landscape has most recently been interpreted as an esker, which is a ridge formed by melt water carrying sand and gravel inside or underneath a glacier. However, discussions about its true nature are still ongoing. Turn right on the 'Hoofdstraat' (main street) in the direction of Exloo and take the second turn left into the 'Boslaan'. Cycle in the direction of node 43 until you reach the Hunebedcentrum parking lot on your left. This is the finish of this tour.